همچنین مشخص گردید که در سال‌های اخیر بر شدت ناپایداری جو منطقه افزوده شده است. به طوری که شاخص SIو LIدر این سال‌ها به مقدار صفر نزدیک شده و سایر شاخص‌ها، هر یک میل صعودی به سوی حداکثر آستانه‌های خود داشته‌اند و نیزسطح یخبندان در روزهای تگرگی مورد مطالعه، بین 850 تا 650 هکتوپاسکال یعنی بین ارتفاع 1393 تا 3788 متری در نوسان می‌باشد که در ماه‌های گرم سال این سطح افزایش می‌یابد. Identifying the patterns and synoptic models that create instability and precipitation in the region is necessary. If the systems that come into the area, contain the appropriate thermodynamic structure, i.e. of high volatility, with appropriate heat and humidity, make good rainfall in the region. Thunder storms along with subsidiary phenomena arising from them, such as hailstones, are one of the violent manifestations of nature. In the North West of the country due to geographical conditions in addition to synoptic systems (front cold low pressure systems), instability of local causes urinals (in this instability rising moist air causes rain too) and sometimes because of both the (synoptic system and local instability) heavy showers and hail occur. Thus, in the present research, in order to obtain hailstone risk management in north western part of the country and to reduce damages deriving from it, the evaluation of this destructive phenomenon has been taken into consideration using instability indices. The data used in this study included daily information related to hail of the country's North West region from 25 synoptic stations. Codes of hail (27, 90, 87, 93, 94, 96 and 99) of 100 Codes of Group VII (ww air now) were extracted from the data of the listed stations. In order to detect thermodynamic conditions of the occurrence of this phenomenon during a 18 year statistical period (1992-2009), instability indices, 230 cases of the occurrence of Skew T log P, and glacial levels of PWC, T.T, V.T, C.T, KI, SW, LI, SI hailstone atmospheric climatic diagrams of Tabriz and Kermanshah provinces’ stations to thorough covering of the region were extracted from the Wyoming University website of the United States of America and were studied. Evaluating and comparing the instability indices of days of hail in the North West with the above table, the following conclusions emerged: the values of SI on all days of sampling except on 22 April 1994, 22 April and 29 May 2003, 27 January 2004, 19 May 2005 and 21 November 2009, about 9/73% of the days selected are larger than 4. LI values greater than zero on all days have been evaluated. It means the observed figures on the proposed figure of 100% are contrary to international indicators. SW values in all the days to the days of April 22, 1994, February 11, 2003, April 27, 2005 and November 21, 2009, about 6/82 are less than 150% of study days. Index values are less than 43 days T.T on December 18, 1993, February 11, 1997, January 16 and 6 March and 4 May 1998, 18 February 1998, 23 January and 27 April 2005, respectively. In other words, it can be noted that about 8/34% of observation days is contrary to the global indices. Days of less than 15, KI includes 30.4% of the studied days. it means on December 18, 1993, February 11 and March 8, 1997, January 16 and 6 March and 4 May 1998 and 23 January 2005, CT values of about 39% of studied days on December 18, 1993, April 22, 1994, February 11 and 3, 1997, January 16 and 6 March and 4 may 1998, 8 February 1999 and 29 may 2003 were lower. V.T index also includes amounts less than 25 days of December 18, 1993, February 11, 1997, January 16, 6 March 4, 1998, February 8, 1999, is April 4, 2002 and January 23, 2005. In other words, about 8/34% of studied days are incompatible with global indices figures. Moreover, it was observed that atmospheric instability of the region has aggravated in recent years, so that SI and LI indices have approached zero in the past few years and other indices have each ascended one millimeter towards their maximum thresholds. Additionally, glacial level in the hailstone days under study fluctuates between 850 to 650 Hectopascal, i.e. between the altitude of 1393 and 3788 meters. This level increases in the hot months of the year. 1- برنا، فاخرنسب؛ رضا، احمد؛ 1391، بررسی شاخص‌های ناپایداری k، LIو L.C.L در وقوع توفان‌های تندری در ایستگاه دزفول، اولین همایش ملی جغرافیا، مخاطرات محیطی و توسعه پایدار، دانشگاه آزاد اسلامی اهواز، اهواز، 7-1. 2- تاج بخش، غفاریان، میرزایی؛ سحر، پروین، ابراهیم؛ 1388، روشی برای پیش بینی رخداد توفان‌های تندری با طرح دو بررسی موردی، مجله فیزیک زمین و فضا، شماره 4، 166- 147. 3- ثنایی نژاد، صالحی، بابائیان؛ سیدحسین، حسن، ایمان؛ 1388، تحلیل سینوپتیکی و دینامیکی پدیده‌های همرفتی محلی به منظور بهبود پیش بینی آنها/ مطالعه موردی: توفان و تگرگ مورخه 6 مرداد1388 در مشهد، چهاردهمین کنفرانس ژئوفیزیک ایران، تهران، دانشگاه تهران، 5-1. 4- جعفرپور، ابراهیم، 1385، اقلیم شناسی، چاپ ششم، تهران،انتشارات دانشگاه تهران، 372-1. 5- حاجی بابایی، نصیری، معزی؛ نوید، آزاده، مینا؛1384، بررسی سینوپتیکی بارش تگرگ، مجموعه مقالات کنفرانس بین‌المللی مخاطرات زمین، بلایای طبیعی و راه کارهای مقابله با آنها، دانشگاه تبریز، تبریز. 6- زاهدی، چوبدار؛ مجید، اصغر، 1386، مقایسه‌ی شاخص‌های ناپایداری جوی حوضه‌ی آبریز آجی چای با استانداردهای ناپایداری جوی و تعیین الگو برای این حوضه، جغرافیا و توسعه‌ی ناحیه‌ای، شماره 9، 44-23. 7- سیف، مهرزاد، 1375، بررسی توزیع بارش تگرگ در ایران و مطالعه موردی آن، پایان نامه کارشناسی ارشد، مؤسسه ژئوفیزیک، دانشگاه تهران، تهران. 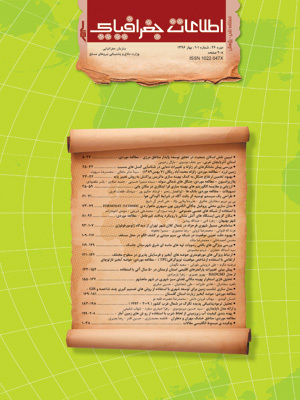 8- صادقی حسینی، رضائیان؛ رضا، مهتاب؛ 1385، بررسی تعدادی از شاخص‌های ناپایداری و پتانسیل بارور سازی ابرهای همرفتی منطقه اصفهان، فیزیک زمین و فضا، شماره 2، 98- 83. 9- عبدمنافی، دینا، 1383، بررسی شاخص‌های ناپایداری، برش قائم باد و وضعیت‌های رطوبتی در هنگام نزول تگرگ در تهران (حداقل 15 مورد از سال 2000 به قبل)،پایان نامه کارشناسی ارشد، دانشگاه آزاد اسلامی، واحد تهران شمال. 10- علیجانی، بهلول، 1388، اقلیم شناسی سینوپتیک، تهران، چاپ سوم، انتشارات سمت، 257- 1. 11- علیجانی، بهلول،1389، آب و هوای ایران، چاپ دهم، نشر پیام نور، تهران، 221- 1. 12- قشلاقی، مینا، 1386، بررسی تأثیر تگرگ بر روی مناطق کشاورزی استان‌های آذربایجان شرقی و غربی، پایان نامه کارشناسی ارشد، دانشگاه آزاد اسلامی، واحد علوم تحقیقات. 13- قویدل رحیمی، یوسف، 1390، کاربرد شاخص‌های ناپایداری جوی برای آشکارسازی و تحلیل دینامیک توفان تندری روز 5 اردیبهشت 1389 تبریز، فصلنامه‌ی علمی- پژوهشی فضای جغرافیایی، شماره 34، 208 -182. 14- لشکری، حسن و امینی، میترا، 1388، تحلیل سینوپتیک و پهنه بندی بارش تگرگ در خراسان بزرگ برای دوره‌ی آماری (2005-1996)، نشریه جغرافیا و برنامه ریزی، دانشگاه تبریز، شماره 31، 108-51 . 15- مسعودیان، کاویانی؛ سید ابوالفضل، محمدرضا؛ 1387، اقلیم شناسی ایران، چاپ اول، اصفهان، انتشارات دانشگاه اصفهان، 179- 1. 16- میرموسوی، اکبرزاده؛ سیدحسین، یونس؛ 1388، مطالعه شاخص‌های ناپایداری در تشکیل تگرگ در ایستگاه هواشناسی تبریز، مجله علمی- پژوهشی فضای جغرافیایی، شماره25، 108-95. 18- Cheng, L. English, M. Wong, R. 1985, Hailstone size distributions and Their Relationship to Storm Thermodynamics: Journal of Climate and Applied Meteorology Vol. 24, pp. 1059-1067. 19- Chroma, K., Brázdil, K. and Tolasz, R. 2006, Temporal andSpatial Variability of Hailstorms in Moravia and Silesia(Czech Republic) in the 19th–20thcenturies: GeophysicalResearch Abstracts Vol. 8, 04367. 20- Costa, S, Mezzasalma,P, Levizzani, V,Alberoni, P. P, Nanni, S. 2001, Deep convection over Northern Italy: synoptic and thermodynamic analysis: Atmospheric Research 56, pp. 73-88. 21- Haby. J, 2003, Severe Weather Indices Pege, Available at:http://www.theweather prediction.com/severe/indices/، (dec, 2013). 22- Simeonov, Petio. Georgiev, G. 2001, A case study of tornado-producing storm south of Rhodopes mountain in the Eastern Mediterranean: Atmosphere 57, pp. 187- 199. 23- Siouts, M. V. Flocas, H. A. 2003, Hailstorms in Northern Greece: synoptic patterns and thermodynamic environment: Theor, Appl, Climatol 75, pp. 189-20.